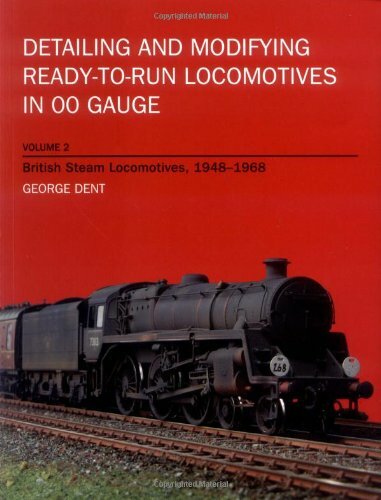 George Dent has published the second in a series of books on detailing locomotives, this time taking on the steam engine in its declining years. Detailing and Modifying Ready to Run Locomotives in 00 Gauge: British Steam Locomotives, 1948-1968 is an excellent book which covers everything you need to know about detailing British steam locos in the period after Nationalisation. Even if you don’t want to get stuck into some of the more complex projects, there is still plenty to learn in here that can help you make your locos different from the ready-to-run versions quickly and without major repainting. Detailing and Modifying Ready to Run Locomotives in 00 Gauge: British Steam Locomotives, 1948-1968 covers basic customisation then looks at super detailing, splitting this down into three parts, and provides an excellent case study based around an LBSCR Terrier 0-6-0. Theres also a chapter devoted solely to tenders, the “tender trap” as George calls it. As you would expect from George Dent there’s lots of attention to painting and weathering. This book is brilliant, it makes no assumptions that you have a wealth of knowledge about steam engines without being patronising. Plenty of colour photos, it takes you through how to get the best out of your engines in easy step by step stages which will build not only skills but give you the confidence to do these things. All I’d say is if you want to take the first step into a bigger world that will help you get the most out of your locos then buy this book and make that move up the ladder. Detailing and Modifying Ready to Run Locomotives in 00 Gauge: British Steam Locomotives, 1948-1968 is published by The Crowood Press and has 160 pages.